Left to right: Maya Uno of Hoy-Scott Watershed Society, Jim Baird and Evelyn Alemanni of Communities in Bloom. Hoy Creek Hatchery was once again a point of interest for visiting judges of the Communities in Bloom competition. "Communities in Bloom - Collectivités en fleurs is about greening through environmental, natural heritage conservation and horticultural actions that involve citizens, businesses, institutions, and municipalities. The program is focused on environmental stewardship through enhancement of green spaces." On July 19 Jim Baird (USA) and Evelyn Alemanni (USA) spent a busy day visiting City parks and locations and the salmon hatchery is one of the key places in the city that exemplify their ethos. Leading the tour for the Hoy-Scott Watershed Society was Maya Uno, a City of Coquitlam environmental award recipient. 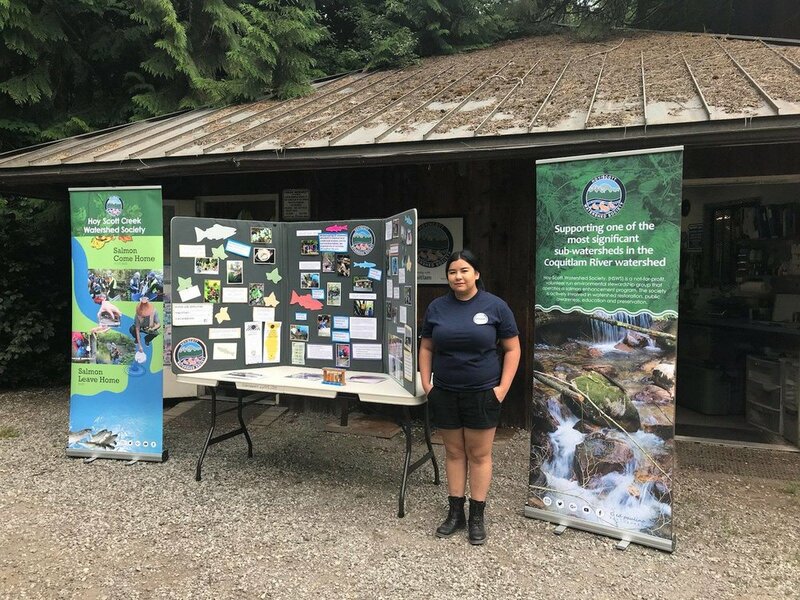 HSWS member and environtmental award recipient, Maya Uno at Hoy Creek Hatchery.